It has finally arrived - the much anticipated COP21 in Paris. There is an optimistic buzz of anticipation here on the almost 18 hectare conference centre plot in northern Paris. World leaders have all gathered here today in the hopes of finalising a new climate deal. A climate deal that will hopefully lock the world into no more than a 2 degree rise in temperature. A deal that will help those worldwide already feeling and fighting the affects of climate change. Today saw 150 heads of state including the United States President Barak Obama, Canadian Prime Minister Justin Trudeau and Russian President Vladimir Putin, all welcomed by French President Francois Hollande to COP21. Heads of states of countries that have previously hosted UNFCCC COP's all gave opening speeches in the plenary rooms. “The word historic is often overused, but here, at this conference, it is not,” said Laurent Fabius, the French Foreign Minister. “Let there be no doubt, the younger generation is watching what we do,” said US President Barak Obama. IFAD has an exhibition space within COP21 where it will be encouraging COP attendants to sign up to IFAD's change.org petition asking for more climate finance to be pledged to smallholder farmers from the developing world. As we know, smallholder farmers are on the frontline of climate change. 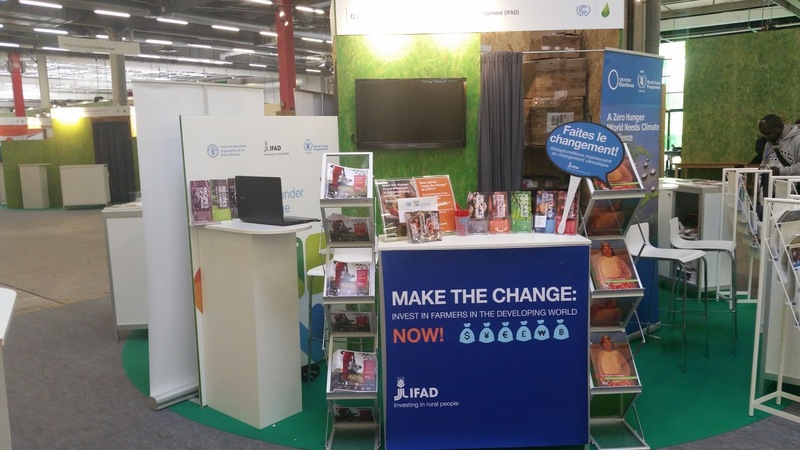 IFAD is doing all it can to help, but hopes are high that at this historic event, the world will come together and pledge extra help and funds, so as to all end climate change together. IFAD will also be promoting the work being done by its Adaptation for Smallholder Agriculture Programme (ASAP). ASAP is the biggest climate change fund for smallholder adaptation in the world. It is focusing on new and innovative ways to adapt to the impacts of climate change, whilst preserving natural resources and yields at the same time.